Amazingly, there’s only two weeks left of 3Q13, and with 25% of the year left to go, the S&P 500 has had a great run. 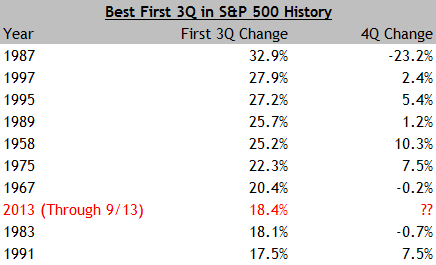 So far, 2013 has posted the 8th best first 3 quarters in $SPX history going back to 1957. Below are the top 10 years as well as how the index performed in 4Q during each of those. Aside from the 1987 crash, the 4th quarter has tended to follow the tone set earlier in the year. The index has maintained a positive trajectory two thirds of the time. Along with the first 3 quarters data, below is a chart for 1967, which is the year with the closest correlation that I could find to 2013. 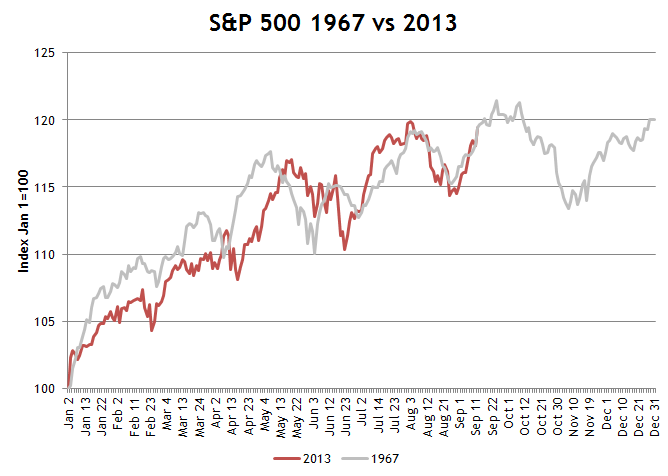 Unfortunately, 1967 happens to be one of the years that the S&P 500 was negative in 4Q.